Not to be flippant about anything as serious as breast or cervical cancer, but I wanted to call attention to this item from our calendar of events (The Rail). Having recently written about Lisa Johnson, who was diagnosed with breast cancer at age 39, I was excited to see this opportunity for women with no insurance or who are under-insured to get free mammograms and pap tests. Space is limited and appointments are required (see below). Addendum: I just spoke to Lisa today. She is continuing to receive treatment and is in good spirits. She had a “wonderful” Valentine’s Day wedding/renewal of vows with her sweetie Steve, and she thanks all in the community for their support. The family is experiencing serious financial hardship as a result of Lisa’s illness. Friends have established a benevolent account for Lisa and her family. Donations may be made at any branch of Washington Mutual. Peninsula Community Health Services and the Kitsap County Health District will collaborate to bring a free one-day women’s health screening event to Kitsap County on March 28 as part of the 2009 West Sound Women’s Show sponsored by Soroptimist International of Greater Bremerton. Screenings will be from 9 a.m. to 3:45 p.m. at the President’s Hall at the Kitsap County Fairgrounds, 1200 NW Fairgrounds Road in Bremerton. There will be breast and cervical health screening, including a mammogram and Pap test free to women between 40 and 64 who are uninsured, have limited insurance or who have limited income. Exams will be conducted in the Swedish Hospital Breast Care Express, a full-service, self-contained, 64-foot mammography unit and women’s preventive exam clinic on wheels. A variety of health resources also will be available. Child care will be provided during the exam, interested women should make an appointment by calling patient resources at Peninsula Community Health Services at (360) 377-3776. Space is limited, so appointments should be made as soon as possible. Imagine having only two weeks to plan and carry off a dream wedding. 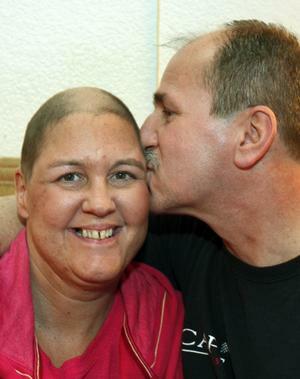 Time is of the essence for Lisa Johnson, a Manchester mother of three teenage girls, who has cancer that has spread from her breast to other parts of her body. Lisa and Steve Johnson will be married 20 years March 18. They had hoped to renew their vows on their anniversary. The first time, they stood before a justice of the peace in a local living room, but Lisa has always wanted a “real” wedding. So when her co-workers at Fred Meyer in Port Orchard learned that her condition had deteriorated and is now life-threatening, they shifted into high gear to give her the wedding of her dreams, set for Valentine’s Day. I’ll be writing about what it took to pull it off for a story set to run that day. Working through the nonprofit Making Memories, Lisa’s friends are arranging for everything: the service at First Christian Church, flowers, cake … even a designer gown. The organization helps women with metastatic breast cancer realize life-long dreams, but their generosity doesn’t cover everything. The folks at Fred Meyer have done most of the legwork on preparing for the event, and there will likely be costs not covered by Making Memories. So Lisa’s friends have set up an account for her at Washington Mutual. Stop by any branch to make a donation. Mention the Lisa Johnson account. On a related note, there will be an organizational meeting from 6:30 to 8:30 p.m. next Thursday (Feb. 12) at MoonDogs Too, 714 Bay St. in Port Orchard, for anyone interested in taking part in the inaugural Seattle Rock n Roll marathon, a fund-raising event to combat cancer hosted by the Lazarex Cancer Foundation.